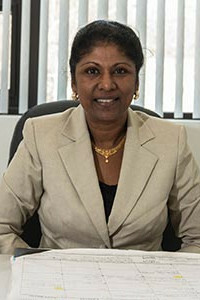 Dr. Uma Dhanabalan, M.D., MPH, FAAFP, MRO . Dr. Uma V.A. Dhanabalan, MD, MPH, FAAFP, MRO is a highly respected physician trained in Family Medicine and Occupational & Environmental Medicine. She is Board certified in Occupational Medicine, Medical Review Officer and Fellow of the American Academy of Family Physicians. She received her Medical Degree from the University of Medicine and Dentistry of Newark, New Jersey and her Master’s Degree in Public Health specializing in Occupational & Environmental Medicine from the Harvard School of Public Health, Harvard University in Boston, Massachusetts. She received the Resident Research Award from the American College of Occupational & Environmental Medicine for her research project: “Occupational & Environmental Exposure to Lead in South India” She is a Clinical Instructor at Tufts University School of Medicine in the Department of Public. Health and Family Medicine in Boston, Massachusetts, and an Adjunct Assistant Professor at Emory University, Rollins School of Public Health in the Department of Environmental; and Occupational Health Atlanta, Georgia. Dr. Dhanabalan is the founder/CEO of Global Health & Hygiene Solutions, LLC in Cambridge, Massachusetts. Global Health and Hygiene Solutions mission is to promote wellness and prevent illness. The tools and lectures created are used in health screening and for education.